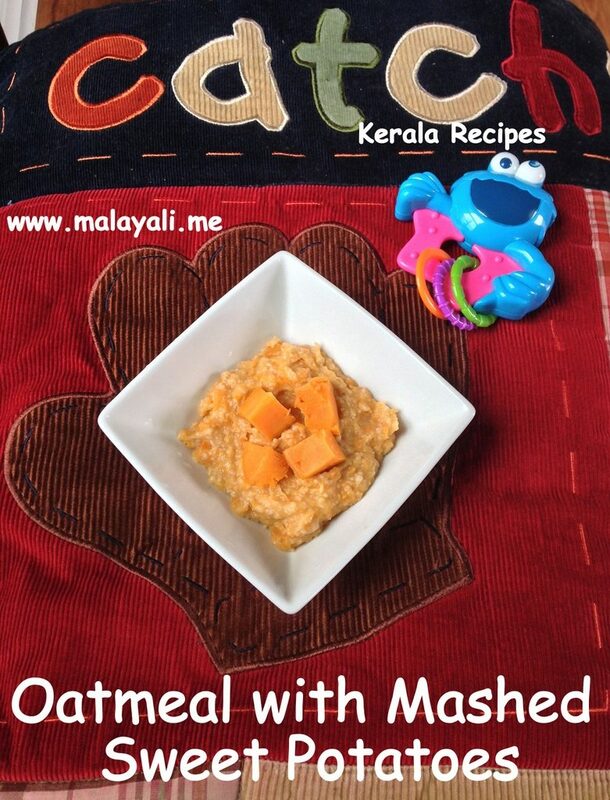 Oats are an excellent way to include grains in your baby’s diet. You can start introducing Oatmeal from around 6 months. Since oatmeal is rich in fiber, it is less likely to cause constipation in babies compared to Rice Cereal. Rather than buying commercial Oat Cereal, you can easily prepare it at home. Grind Rolled or Quick Cooking Oats into a powder and store it in a container. Cook it with water and then mix with fruit or vegetable purees for an easy breakfast. I started giving my little one Oats when he turned seven months. Initially, I would powder oats very finely and then cook it in water. Now a days, I coarsely grind the oats as he can tolerate texture. I often add bananas, blue berries, pears, apples, sweet potatoes and other fruits or veggies to his oatmeal. Grind 1 cup of Oats into a smooth or coarse powder depending on whether your baby can tolerate texture or not. Store it in an airtight container and keep it in a cool place. Best to use it within one or two weeks. Bring 1/2 to 3/4 cup water to a boil in a small saucepan. Reduce heat to medium and add 2 tbsp of oats and cinnamon. Keep stirring for 3-4 minutes so that the mixture thickens and there are no lumps. You can add more water for a thinner consistency. Mash the sweet potatoes and mix it with the oats. Serve warm. I like to cook sweet potatoes in bulk and then use it for different meals throughout the week. Here is how I cook Sweet Potatoes. Wash and peel 3 large sweet potatoes. Dice it into small pieces. Steam it for around 10-15 minutes until soft. 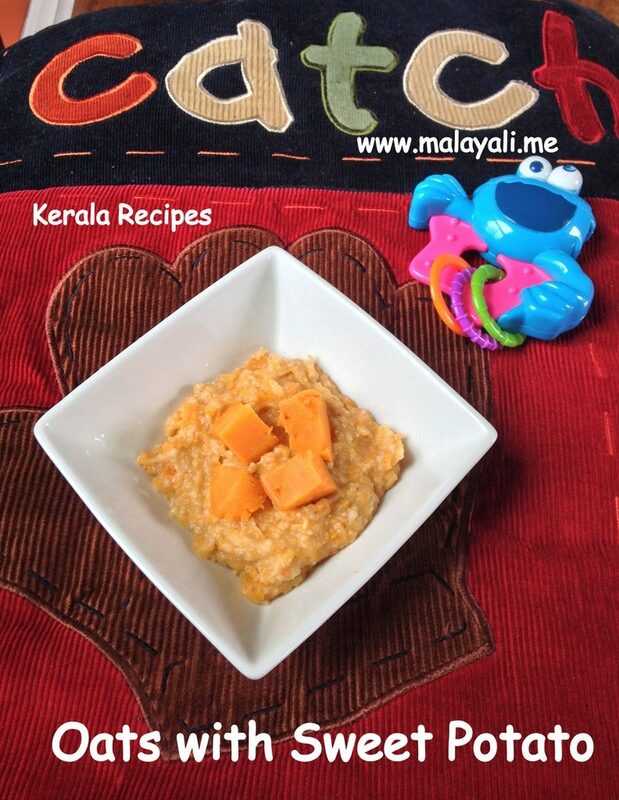 If your baby is just starting on solids, puree the sweet potatoes along with water to a smooth paste. If your baby can tolerate finger foods, you can give soft cooked pieces. I sometimes cook oats in Cow’s Milk instead of water. Be sure your baby doesn’t have Dairy Allergies if you are using Milk. Loved ur blog ! Not just this one , but womens world as well..even i have a 10 month old and ws looking for some baby recipes and this seems to b a good one.In this post u have mentioned using milk,but i have heard its best to introduce milk after a year,U could substitute milk with formula..use water to cook and then add in diluted formula before it cools down.